Based on Walter Farley’s 1941 novel of the same name, The Black Stallion (1979) is beautifully shot art house film for children, which is unthinkable in this day and age of noisy CGI animated movies and dumbed-down live-action fare. This is due in large part to the intelligent screenplay – written by Melissa Mathison, Jeanne Rosenberg, and William D. Wittliff – and the masterful direction of Carroll Ballard who got an incredibly sensitive performance out of a young boy by the name of Kelly Reno. The film was regarded as a unique anomaly when it came out and continues to be one of the most under-appreciated children’s films. Alec Ramsay (Reno) is a young boy traveling with his father (Axton) on a ship off the coast of North Africa in 1946. Ballard creates an exotic mood right from the get-go with Carmine Coppola’s low-key experimental score and Caleb Deschanel’s hand-held camerawork, popular in 1970s documentaries. Alec spots a majestic-looking Arabian stallion being treated poorly by its handlers. He goes below deck to tell his father about this wonderful horse, but he’s in a high stakes card game with some shifty-looking players. The young boy takes a bunch of sugar cubes and feeds them to the horse. Later on, Alec’s father shows his son all the loot he won in the card game. Naturally, he pockets the money, but gives the boy a pocket knife and a figurine of Bucephalus, Alexander the Great’s magical horse. In an enthralling scene, he tells Alec the story of how Alexander tamed and befriended Bucephalus, foreshadowing Alec’s relationship with “The Black,” the horse on the ship. Most of the dialogue spoken in the first half of The Black Stallion is done in this scene as Ballard relies on visual storytelling, which is quite effective in the harrowing sequence where the ship is sunk by severe weather. He does an excellent job of conveying the chaos that ensues as everyone frantically tries to escape the sinking ship via nightmarish lighting and disorienting camerawork. This is an intense scene for a children’s film as Alec and The Black narrowly escape. Both of them wash up on a small, deserted island. Alec must first gain The Black’s trust and then over time they bond, surviving by their wits. There is no dialogue during these scenes as Ballard relies on Reno’s expressive face and the way he interacts with the horse to tell the story of their emerging friendship. 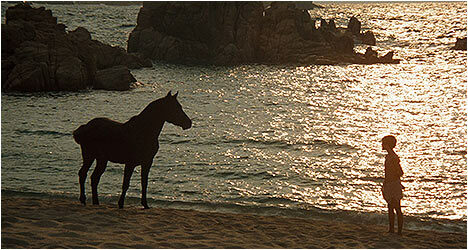 This is enhanced by Coppola’s wonderfully minimalist score and Deschanel’s stunning cinematography that initially presents the island as an imposing, unforgiving environment to one that gradually becomes a beautiful haven, of sorts, as Alec and the horse become more familiar with their surroundings. This entire stretch of The Black Stallion resembles a children’s adventure film as if directed by Terrence Malick as we get one stunning shot of the sky and the island after another. What really stands out in the first half of this film is the acting of first-timer Kelly Reno. Once Alec is stranded on the island with The Black, he has to convey a whole range of emotions – fear, sadness, and wonderment – and does so convincingly. In addition, he has to interact with this horse and make us believe that they are developing an unbreakable bond. This is not an easy task for a seasoned actor much less an inexperienced child, but the lack of formal training actually works to Reno’s advantage, giving his performance an authentic feel. As most critics at the time of its release noted, because the first half of The Black Stallion is so bold in its unconventional storytelling, the second half is a little anticlimactic as Alec and The Black are rescued and return home where they cross paths with Henry Dailey (Rooney), a veteran horse trainer who is coaxed out of self-imposed retirement by the young boy to prepare both of them for a big race. Mickey Rooney brings his trademark charm to the role while delivering a nicely understated performance as a man whose passion for racing is reignited by Alec and his mysterious horse. There is an almost haunting look of defeat on Rooney’s face when we first meet Henry, but this soon gives way to joy as he dusts off all his techniques and imparts his knowledge on the boy. These scenes take a fascinating look at what needs to be done to train not just a horse, but a rider for a race. Even though it is easy to figure out how The Black Stallion will end, Ballard manages to wring every ounce of tension out of the climactic race, and does little to diminish the emotional impact. So many films that involve animals are full of silly slapstick or are rife with sappy sentimentality. The Black Stallion is refreshingly devoid of either. It is a sincere children’s film that can also be appreciated by adults who will marvel at its craftsmanship while still getting caught up in the engrossing story and the relationship between its two engaging lead characters. It transcends any notions of personal nostalgia and should be regarded as an under-appreciated masterpiece. The Blu-Ray transfer is nothing short of stunning, highlighting Caleb Deschanel’s masterful cinematography. There is a wonderfully warm, filmic look that has been preserved, here. There is a collection of “Short Films” that director Carroll Ballard made before The Black Stallion. “Pigs!” (1965) is an 11-minute documentary about pigs on a farm. “The Perils of Priscilla” (1969) is a 17-minute film about a cat that escapes from its home and survives on the streets of Los Angeles. “Rodeo” (1969) is a 20-minute doc. about champion bull rider Larry Mahan. “Seems Like Only Yesterday” (1971) is a 47-minute doc. that features interviews with 12 centenarians as they recount how L.A. has changed over the years. Finally, “Crystallization” (1974) is an 11-minute educational film shot through a microscope about the patterns created through the formation of crystals. “Carroll Ballard and Scott Foundas” features the film critic talking to the director briefly about his early life and how he got into film. From there, he talks about cutting his teeth on educational and industrial films. Ballard says that he was in bad financial shape when he got a call from Francis Ford Coppola, an old classmate, who wanted to work with him. Used to working with small crews and very little money, he was terrified working on a large scale and was almost fired from the project. Ballard recounts several fascinating filming anecdotes on this wonderful extra. “Caleb Deschanel” is interviewed and talks about working with Ballard and the man’s working methods. He recounts his experiences working on The Black Stallion including how they found certain locations and working with a Canadian crew vs. an Italian crew. He talks about the challenges of working with animals and children. Still photographer Mary Ellen Mark talks about her experience photographing the cast and crew on location in Toronto and Sardinia. She shares her views on many of the photos she shot and her impressions of Mickey Rooney and Kelly Reno.